The company, now seven years old, is currently on a UK push, touring the country, espousing the virtues of crowdfunding as a source of finance for aspiring startups located away from London’s coffers, Ringelmann explains. Indeed, Ringelmann says that one of the most enjoyable things about the tour so far has been hearing about different regions around the UK almost competing against each other to see who has the most good ideas. Initially, and on the surface of it still today, Indiegogo’s mission is as stated: “to democratize fundraising” by providing a source of cash for people locked out of traditional capital – banks and venture capitalists primarily. But cast your eyes over the site now and you’ll increasingly see that more and more projects are second or third iterations. In other cases it’s a well-known brand trying to raise awareness and gauge feedback. It’s a market research tool that allows companies to tweak product options directly in response to customers. It’s a place that allows you to build a market before you even build your product, for better or worse. And on another level, it means a company can now bypass traditional funding altogether, if they’re successful enough. Nonetheless, the financial landscape may be shifting, but Ringelmann argues that there will still always be a role for VCs. While this might seem contrary to the general spirit of crowdfunding – it’s easy to equate crowdfunding with some sort of grass roots or ‘indie’ activity – if your aim is to be totally non-discriminatory in providing a platform for anyone to raise funds, then that really means it’s open to anyone. Naturally, the benefit of non-discriminatory acceptance of all comers for Indiegogo is more money in fees; it charges a percentage of each campaign’s take for its troubles and advice. Ringelmann says that if backers do have concerns, there are dedicated Indiegogo helpers that people can get in contact with. Furthermore, she argues that as people can get involved from the ground up and keep a close eye on things themselves, projects tend to be sort of self-regulating. “Indigogo is allowing people to participate in the ideation and creation process, so it’s not just about buying a Perk [Indigogo’s funding tiers, essentially]… It allows people to engage in the creation going on around them. That’s all well and good if you’re willing to take the potential for delays on the chin and have a responsive project creator that keeps you up to date, but what happens if you hear nothing a couple of months down the line? Ringelmann added that other activities like introducing mentors in residence to give feedback to campaign owners, to teach them how to be entrepreneurs, as well as just how to raise money, also helps in this regard. 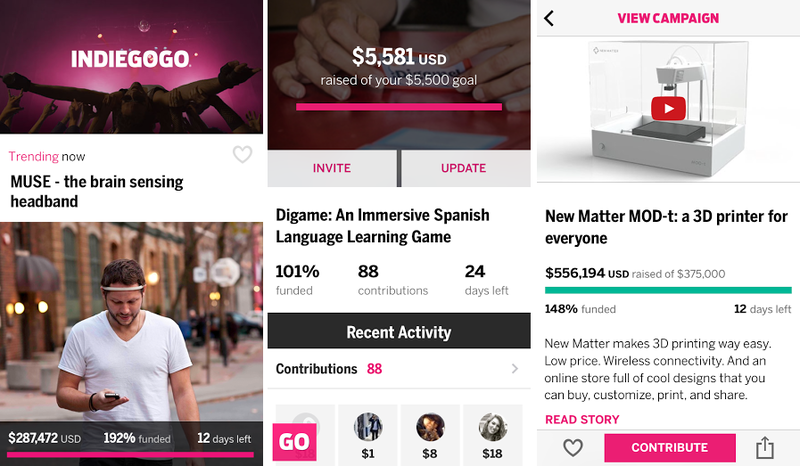 Indiegogo launched its first native app today, but only for iPhone owners in Canada. Of course, a dedicated scammer would likely respond to messages from potential backers and give regular updates, that’s how a good scam would work. So what other safeguards are in place on Indigogo to protect backers? Trust is huge. It’s really important to us, it’s a word we talk about every day… When we built the system as an open system for a billion people to deliver on our mission, we knew that, as with any open system like eBay or whoever, there would be probably be some people that tried to use it in a way that wasn’t intended, scamming or whatever. We’ve just built, on the on the backend, infrastructure, processes and data-based algorithms that really catch stuff faster than any human being could catch. We shut down campaigns and shut down payments and return funds automatically through our system. Ringelmann added that there’s also a ‘Trust and Safety’ team to review things if something else is questionable and a community flagging system, so if something does go live and looks suspicious it can be flagged for internal review. Trust, as already noted, is essential for the ongoing growth of the crowdfunding movement; it won’t take too many high profile flops to put a dent in the goodwill and excitement of low level funders, so having several methods and layers of checks in place is vital in the long term. The key for Indiegogo lies in how well it can continue to maintain its balance of providing a non-discriminatory platform for one-and-all against the potential for disappointment, delays and non-delivery. With a 1,000 percent increase in the amount of funding raised through the platform in the last two years, it would seem to be a trust battle that it’s just about winning right now.